This title offers five brand new Christmas stories for little children by Sam Taplin. It is magically illustrated by Violeta Dabija and perfect for sharing at bedtime. 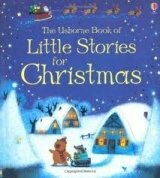 It includes the story of the smallest Christmas tree, the story of how little owl learnt about Christmas, and the story of Fox and Badger's Christmas stockings.